The term "Jihadism" (also "jihadist movement", "jihadi movement" and variants) is a 21st-century neologism found in Western languages to describe Islamist militant movements perceived as military movements "rooted in Islam" and "existentially threatening" to the West. It has been described as a "difficult term to define precisely", because it remains a recent neologism with no single, generally accepted meaning. The term "jihadism" first appeared in South Asian media; Western journalists adopted it in the aftermath of the September 11 attacks of 2001. It has since been applied to various insurgent and terrorist movements whose ideology is based on the notion of jihad. Contemporary jihadism ultimately has its roots in the late 19th- and early 20th-century ideological developments of Islamic revivalism, which developed into Qutbism and related ideologies during the mid-20th century. The terrorist organisations partaking in the Soviet–Afghan War of 1979 to 1989 reinforced the rise of jihadism, which has been propagated in various armed conflicts throughout the 1990s and 2000s. Gilles Kepel has diagnosed a specifically Salafi jihadism within the Salafi movement of the 1990s. Jihadism with an international, Pan-Islamist scope in this sense is also known as global jihadism. "Jihadism" is usually defined[by whom?] as Sunni Islamist armed struggle, and fighters often target Shia Islam, as well as Sufism and Ahmadiyya. According to Martin Kramer as of 2003, "jihadism is used to refer to the most violent persons and movements in contemporary Islam, including al-Qaeda." David Romano has defined his use of the term as referring to "an individual or political movement that primarily focuses its attention, discourse, and activities on the conduct of a violent, uncompromising campaign that they term a jihad". Following Daniel Kimmage, he distinguishes the jihadist discourse of jihad as a global project to remake the world from the resistance discourse of groups like Hizbullah, which is framed as a regional project against a specific enemy. The term "jihadist globalism" is also often used in relation to jihadism. Academic Manfred Steger proposes an extension of the term "jihadist globalism" to apply to all extremely violent strains of religiously influenced ideologies that articulate the global imaginary into concrete political agendas and terrorist strategies (these include Al Qaeda, Jemaah Islamiyah, Hamas and Hezbollah, which he finds "today's most spectacular manifestation of religious globalism"). "Jihad Cool" is a term used by Western security experts concerning the re-branding of militant jihadism into something fashionable, or "cool", to younger people through social media, magazines, rap videos, toys, propaganda videos, and other means. It is a sub-culture mainly applied to individuals in developed nations who are recruited to travel to conflict zones on jihad. For example, jihadi rap videos make participants look "more MTV than Mosque", according to NPR, which was the first to report on the phenomenon in 2010. Maajid Nawaz, founder and chairman of the anti-extremism think tank Quilliam, defines Jihadism as a violent subset of Islamism: "Islamism [is] the desire to impose any version of Islam over any society. Jihadism is the attempt to do so by force." A black flag reportedly used by Caucasian jihadists in 2002 displays the phrase al-jihad fi sabilillah above the takbir and two crossed swords. According to scholar of Islam and Islamic history Rudoph Peters, contemporary traditionalist Muslims "copy phrases of the classical works on fiqh" in their writings on jihad; Islamic Modernists "emphasize the defensive aspect of jihad, regarding it as tantamount to bellum justum in modern international law; and the contemporary fundamentalists (Abul Ala Maududi, Sayyid Qutb, Abdullah Azzam, etc.) view it as a struggle for the expansion of Islam and the realization of Islamic ideals." Jihad has been propagated in modern fundamentalism beginning in the late 19th century, an ideology that arose in context of struggles against colonial powers in North Africa in the late 19th century, as in the Mahdist War in Sudan, and notably in the mid-20th century by Islamic revivalist authors such as Sayyid Qutb and Abul Ala Maududi. The term jihadism (earlier Salafi jihadism) has arisen in the 2000s to refer to the contemporary jihadi movements, the development of which was in retrospect traced to developments of Salafism paired with the origins of Al-Qaeda in the Soviet–Afghan War during the 1990s. Jihadism has been called an "offshoot" of Islamic revivalism of the 1960s and 1970s. The writings of Sayyid Qutb and Mohammed Abdul-Salam Farag provide inspiration. The Soviet–Afghan War (1979–1989) is said to have "amplified the jihadist tendency from a fringe phenomenon to a major force in the Muslim world." It served to produce foot soldiers, leadership and organization. Abdullah Yusuf Azzam provided propaganda for the Afghan cause. After the war veteran jihadists returned to their home countries and dispersed to other sites of conflicts involving Muslim populations such as Algeria, Bosnia and Chechnya creating a "transnational jihadist stream." An explanation for jihadist willingness to kill civilians and self-professed Muslims on the grounds that they were actually apostates (takfir) is the vastly reduced influence of the traditional diverse class of ulama, often highly educated Islamic jurists. In "the vast majority" of Muslim countries during the post-colonial world of the 1950s and 60s the private religious endowments (awqaf) that had supported the independence of the Islamic scholars/jurists for centuries were taken over by the state. The jurists were made salaried employees and the nationalist rulers naturally encouraged their employees (and their employees interpretations of Islam) to serve the rulers' interests. Inevitably the jurists came to be seen by the Muslim public as doing so. Into this vacuum of religious authority came aggressive proselytizing funded by tens of billions of dollars of petroleum-export money. The version of Islam being propagated (Saudi doctrine of Wahhabism) billed itself as a return to pristine, simple, straightforward Islam, not one school among many, and not interpreting divine law historically or contextually, but the one, orthodox "straight path" of Islam. Unlike the traditional teachings of the jurists who tolerated and even celebrated divergent opinions and schools of thought and kept extremism marginalized, Wahhabism had "extreme hostility" to "any sectarian divisions within Islam". The term jihadist is almost exclusively used to describe Sunni extremists. In Syria, where there are thousands of foreign Muslim fighters engaged in the civil war, for example, non-Syrian Shia are often referred to as "militia", and Sunni foreigners as "jihadists" (or "would-be jihadists"). [Note 3][Note 4] One who does use the term "Shia jihad" is Danny Postel, who complains that "this Shia jihad is largely left out of the dominant narrative." According to Shadi Hamid and Rashid Dar, jihadism is driven by the idea that jihad is an "individual obligation" (fard ‘ayn) incumbent upon all Muslims. This is in contrast with the belief of Muslims up until now (and by contemporary non-jihadists) that jihad is a "collective obligation" (fard kifaya) carried out according to orders of legitimate representatives of the Muslim community. Jihadist insist all Muslims should participate because (they believe) today's Muslim leaders are illegitimate and do not command the authority to ordain justified violence. The Syrian Civil War became a focus for Sunni fighters waging jihad on Shia. The al-Nusra Front is the largest jihadist group in Syria. The Muslim Brotherhood in Egypt has called for jihad against the Syrian government and against that government's Shi'ite allies. Saudi Arabia backs the jihad against the Shia in Syria using proxies. Sunni jihadi converge in Syria from Saudi Arabia, Bahrain, Yemen, Kuwait, Tunisia, Libya, Egypt, Morocco, as well as other Arab states with Chechnya, Pakistan, Afghanistan and Western countries. During the Soviet-Afghan war in the 1980s, many Muslims received calls for a jihad against atheists. Mujahideen were recruited from various countries including Egypt, Pakistan, and Saudi Arabia. The conflict gradually turned from one against occupation to one seen as a jihad. Ayman al-Zawahiri declared a fatwa of jihad against Jews in 1998. ^ Use of "jihadism" has been criticized by at least one academic (Brachman): "'Jihadism' is a clumsy and controversial term. It refers to the peripheral current of extremist Islamic thought whose adherents demand the use of violence in order to oust non-Islamic influence from traditionally Muslim lands en route to establishing true Islamic governance in accordance with Sharia, or God's law. The expression's most significant limitation is that it contains the word Jihad, which is an important religious concept in Islam. For much of the Islamic world, Jihad simply refers to the internal spiritual campaign that one wages with oneself." 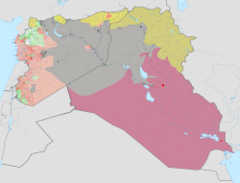 ^ For example: "The battle has drawn Shiite militias from Lebanon, Iraq and Afghanistan on the side of Assad, even as Sunni would-be jihadists from around the world have filled the ranks of the many Islamist groups fighting his rule, including the Islamic State extremist group." ^ The Iranian government has drawn from Afghan refugees living in Iran and the number of Afghans fighting in Syria on behalf of the Assad regime has been estimated at "between 10,000 and 12,000". ^ Compare: Hammer, Olav; Rothstein, Mikael, eds. (2012). "16". The Cambridge Companion to New Religious Movements. Cambridge University Press. p. 263. Retrieved 2018-03-03. 'Jihadism' is a term that has been constructed in Western languages to describe militant Islamic movements that are perceived as existentially threatening to the West. Western media have tended to refer to Jihadism as a military movement rooted in political Islam. ^ Hammer, Olav; Rothstein, Mikael, eds. (2012). "16". The Cambridge Companion to New Religious Movements. Cambridge University Press. p. 263. Retrieved 2018-03-03. 'Jihadism,' like the word jihad out of which it is constructed, is a difficult term to define precisely. The meaning of Jihadism is a virtual moving target because it remains a recent neologism and no single, generally accepted meaning has been developed for it. ^ a b c Martin Kramer (Spring 2003). "Coming to Terms: Fundamentalists or Islamists?". Middle East Quarterly. X (2): 65–77. "French academics have put the term into academic circulation as 'jihadist-Salafism.' The qualifier of Salafism—an historical reference to the precursor of these movements—will inevitably be stripped away in popular usage. "Jihadist-Salafism" is defined by Gilles Kepel, Jihad: The Trail of Political Islam (Harvard: Harvard University Press, 2002), pp. 219-22; and Guilain Deneoux, "The Forgotten Swamp: Navigating Political Islam," Middle East Policy, June 2002, pp. 69-71." ^ Natana DeLong-Bas (2009). "Jihad". Oxford Bibliographies. Oxford: Oxford University Press. (Subscription required (help)). ^ a b "What is jihadism?". BBC News. 11 December 2014. Retrieved 13 October 2016. ^ and by Guilain Deneoux, "The Forgotten Swamp: Navigating Political Islam," Middle East Policy, June 2002, pp. 69-71." ^ Brachman 2008, p. 4. ^ Steger, Manfred B. Globalization: A Short Introduction. 2009. Oxford University Publishing, p. 127. ^ a b Laura Italiano (June 20, 2014). "American Muslims flocking to jihadist group". New York Post. Retrieved August 22, 2014. ^ Steve Emerson (April 15, 2013). "Jihad is Cool: Jihadist Magazines Recruit Young Terrorists". Family Security Matters. Archived from the original on March 11, 2015. Retrieved August 22, 2014. ^ J. Dana Stuster (April 29, 2013). "9 Disturbingly Good Jihadi Raps". Foreign Policy. Retrieved August 22, 2014. ^ Jytte Klausen (2012). "The YouTube Jihadists: A Social Network Analysis of Al-Muhajiroun's Propaganda Campaign". Perspectives on Terrorism. 6 (1). Retrieved August 22, 2014. ^ Cheryl K. Chumley (June 27, 2014). "Terrorists go 'Jihad Cool,' use rap to entice young Americans". Washington Times. Retrieved August 22, 2014. ^ Dina Temple-Raston (March 6, 2010). "Jihadi Cool: Terrorist Recruiters' Latest Weapon". National Public Radio. Retrieved August 22, 2014. ^ Maajid Nawaz (June 14, 2016). "Admit It: These Terrorists Are Muslims". The Daily Beast. Retrieved June 25, 2017. ^ Peters, Rudolph (1996). Jihad in Classical and Modern Islam: A Reader. Princeton: Marcus Wiener. p. 150. ^ Commins, David (2009). The Wahhabi Mission and Saudi Arabia. I.B.Tauris. p. 174. ^ Commins, David (2009). The Wahhabi Mission and Saudi Arabia. I.B.Tauris. pp. 156, 7. ^ Abou El Fadl, Khaled (2002). The Place of Tolerance in Islam by Khaled Abou El Fadl The Place of Tolerance in Islam. Beacon Press. p. 6. Retrieved 21 December 2015. ^ Kepel, Gilles (2006). Jihad: The Trail of Political Islam. I.B. Tauris. p. 51. Well before the full emergence of Islamism in the 1970s, a growing constituency nicknamed 'petro-Islam' included Wahhabi ulemas and Islamist intellectuals and promoted strict implementation of the sharia in the political, moral and cultural spheres; this proto-movement had few social concerns and even fewer revolutionary ones. ^ a b c Abou El Fadl, Khaled (2002). The Place of Tolerance in Islam by Khaled Abou El Fadl The Place of Tolerance in Islam. Beacon Press. pp. 8–9. Retrieved 21 December 2015. ^ "The war against jihadists. Unsavoury allies". The Economist. 6 September 2014. Retrieved 11 October 2016. ^ Bulos, Nabih (17 August 2016). "Soldiers on both sides see the fight for Aleppo as a battle between jihadists". Los Angeles Times. Retrieved 11 October 2016. ^ Heistein, Ari; West, James (20 November 2015). "Syria's Other Foreign Fighters: Iran's Afghan and Pakistani Mercenaries". National Interest. Retrieved 11 October 2016. ^ POSTEL, DANNY (Fall 2016). "Theaters of Coercion: Review of 'Children of Paradise: The Struggle for the Soul of Iran' by Laura Secor". Democracy Journal (42). Retrieved 11 October 2016. ^ see also: Smyth, Phillip (2 October 2013). "Foreign Shia jihadists in Syria". abc.net.au. Retrieved 11 October 2016. ^ Hamid, Shadi; Dar, Rashid (July 15, 2016). "Islamism, Salafism, and jihadism: A primer". Brookings Institution. Retrieved 13 October 2016. ^ "Inside Jabhat al Nusra – the most extreme wing of Syria's struggle". 2 December 2012. ^ Maggie Fick (June 14, 2013). "Egypt Brothers backs Syria jihad, slams Shi'ites". Reuters. ^ Robert F. Worth (Jan 7, 2014). "Saudis Back Syrian Rebels Despite Risks". New York Times. ^ Mark Hosenball (May 1, 2014). "In Iraq and Syria, a resurgence of foreign suicide bombers". The Economist. Abbas, Tahir (2007). Islamic Political Radicalism: A European Perspective. Edinburgh University Press. ISBN 978-0-7486-2528-4. Akbarzadeh, Shahram (2010). Islam and Political Violence: Muslim Diaspora and Radicalism in the West. I B Tauris & Co Ltd. ISBN 978-1-84511-473-2. Al-Rasheed, Madawi (2009). Dying for Faith: Religiously Motivated Violence in the Contemporary World. I B Tauris & Co Ltd. ISBN 978-1-84511-687-3. Aslan, Reza (2010). Global Jihadism. ISBN 978-3-639-25006-0. Gilles Kepel, Jihad: The Trail of Political Islam (2000, 2002, 2006). Brachman, Jarret (2008). Global jihadism: theory and practice. vol. 10 of Cass series on political violence, Taylor & Francis. ISBN 978-0-415-45241-0. * The Devolution of Jihadism: From Al Qaeda to Wider Movement. Stratfor. 2010. ISBN 978-1-4537-4664-6. Coolsaet, Rik (2008). Jihadi Terrorism and the Radicalisation Challenge in Europe. Ashgate. ISBN 978-0-7546-7217-3. Hegghammer, Thomas (2010). Jihad in Saudi Arabia: Violence and Pan-Islamism since 1979. Cambridge University Press. ISBN 978-0-521-51858-1. Khosrokhavar, Farhad (2009). Inside Jihadism: Understanding Jihadi Movements Worldwide. Paradigm. ISBN 978-1-59451-616-0. Lahoud, Nelly (2010). The Jihadis' Path to Self-destruction. C Hurst & Co Publishers Ltd. ISBN 978-1-84904-062-4. Pargeter, Alison (2008). The New Frontiers of Jihad: Radical Islam in Europe. I B Tauris & Co Ltd. ISBN 978-1-84511-391-9. Ranstorp, Magnus (2009). Understanding Violent Radicalisation. Routledge. ISBN 978-0-415-55630-9. Rhodes, Darion (2014). Salafist-Takfiri Jihadism: the Ideology of the Caucasus Emirate. International Institute for Counter-Terrorism. Sageman, Marc (2008). Leaderless Jihad: Terror Networks in the Twenty-first Century. University of Pennsylvania Press. ISBN 978-0-8122-4065-8. Sanchez, James (2007). Who's Who in Al-Qaeda & Jihadi Movements in South and Southeast Asia 19,906 Key Individuals, Organizations, Incidents, and Linkages. Lulu. ISBN 978-1-4303-1473-8. Vertigans, Stephen (2007). Militant Islam: A Sociology of Characteristics, Causes and Consequences. Routledge. ISBN 978-0-415-41246-9.
de Pommereau, Isabelle (2015). To fight homegrown jihadis, Germany takes lesson from battle with neo-Nazis. The Christian Science Monitor. Wikimedia Commons has media related to Jihad.